Monitoring inflows helps us make decisions about what level to select the best quality water. monitoring water quality and analysing trends. Water in storages settles into layers through a process called stratification. The properties of the layers can vary dramatically because of differences in temperature, light, density and oxygen. Water flowing into storages from the catchments (inflow) will move at the level of the same density or temperature. By monitoring the inflow, we can predict where the incoming water will arrive at the dam wall and settle. Off-takes can then be selected from levels away from incoming waters to maintain quality. Temperature is an important indicator of water stratification. 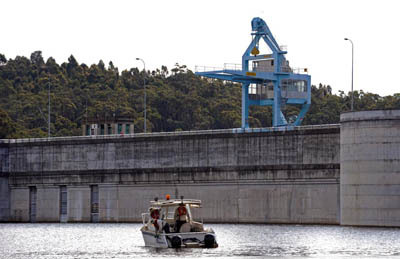 We monitor the storages by devices called thermistors, which record temperatures at different depths within the dams. This helps us understand where the best quality water is sitting within the layers of a storage. Visit also reservoir dynamics and reservoir modelling for more information. There are three off-take chambers on the upstream face of Warragamba Dam. Screens, which allow water to flow from the reservoir and into the water supply to Sydney, can be set at varying levels. The valves are then opened or closed to take only the best quality water available. Water quality monitoring and modelling of inflows into Lake Burragorang (which is the lake created by Warragamba Dam) help WaterNSW make decisions about what level to select the best quality water. In smaller storages, artificial destratifiers (air bubblers or 'stirrers') may be used to keep stored water circulating and to reduce the chance of low oxygen levels in water in the bottom layers. This helps to maintain good water quality by preventing metals from becoming soluble. Soluble metals can be a problem because they may not be eliminated during water filtration processes and may cause aesthetic problems such as taste, odour, or stained washing. Late in winter, lakes experience a phenomenon known as turnover or mixing. This occurs when surface water temperature (and related density) matches that of the cold water at the lake's bottom. The surface water is displaced by the bottom water as the water column inverts (turns over) and mixes. By closely monitoring water quality in different parts of the supply system and analysing trends, WaterNSW is able to 'reconfigure' the system to take only the best quality water. For example, if a major storm event affected water quality in Warragamba Dam, the system would be reconfigured so more water was taken from the Upper Nepean system and Prospect Reservoir until water quality improved at Warragamba Dam. For more information about WaterNSW's monitoring and analysis of water quality, visit Protecting our water quality. Schematic diagram of Greater Sydney's raw water supply system.